Sir Richard Grenville had married Mary St Ledger, and in 1569 he was briefly active alongside the St Ledger family in attempts to settle southern Ireland, holding the position of Sheriff of Cork. The English interference in the affairs of Munster, of which Grenville was a part, prompted a backlash in the form of the Desmond rebellions, the second of which was quashed in 1583. In punishment for that uprising, lands in Munster were confiscated and re-allocated to English “undertakers,” landlords who undertook to colonise the land. Grenville was one such undertaker and had also purchased a large estate in Kinalmeaky. His later efforts to settle these estates bore little fruit, but these links may have helped facilitate BIdeford’s trade with the area, which in later times would flourish. In 1584 Walter Raleigh received a patent to explore and settle any lands in the New World as yet not occupied by Christians. His first expedition, headed by Amadas and Barlowe, located Roanoke Island and returned to England with two of its natives, Manteo (after whom East-the-Water’s link road is named) and Wanchese. A year later the newly knighted Sir Walter named the territory Virginia in honour of his queen, then commissioned his cousin Richard Grenville to return with a larger fleet, Manteo and Wanchese returning with him. 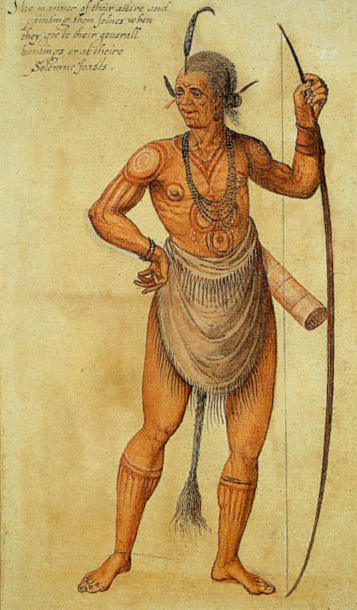 In 1586 the colony almost collapsed, only to be revitalised by Grenville’s next visit, after which he brought back with him Rawley (aka Raleigh), a Wynganditoian Indian, who became the first native American to be baptised in England (and who die in 1589). By the next visit to Roanoake, in1590, the colonists had disappeared and what happened to them was never discovered. Yet, henceforth, links with the New World would become crucial to Bideford’s success.